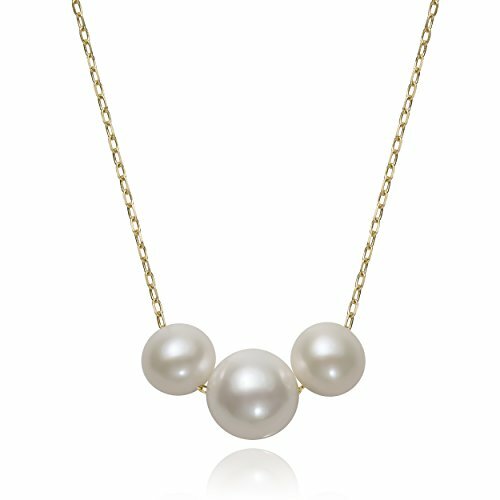 Grace yourself with the feminine charm of this delicate necklace featuring three glowing AA quality white genuine cultured freshwater pearls secured on a 14k yellow gold diamond cut cable chain. Graduated in style, this pearl necklace is made with the kind of quality that is guaranteed to stand the test of time; AA quality pearls are round in shape, well-matched, high-luster, and free of any blemishes or markings. With a design simple enough to wear over and over again, this piece is sure to become a staple in your jewelry collection. If you have any questions about this product by Pearlzzz, contact us by completing and submitting the form below. If you are looking for a specif part number, please include it with your message. High Polished 14K Yellow Gold Plain Slender Cross Pendant with Chain Necklace, 16"
18 Karat Solid Yellow Gold 2mm Cuban Link Curb Chain Necklace- 18K Solid Gold- Made in Italy- 24"